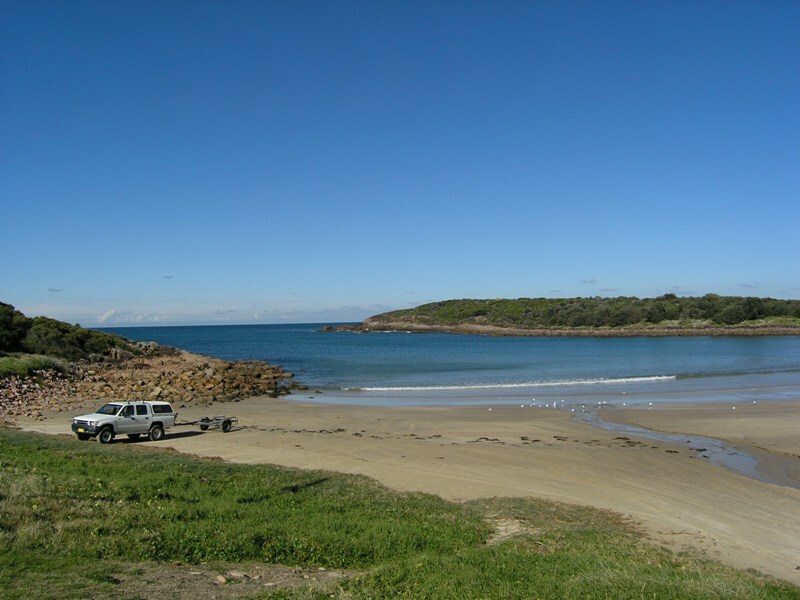 After Fingal Bay, Boat Harbour is the most protected and popular dive site along the coast. The entrance to Boat Harbour is narrow and faces roughly South-East. This means that the inside of the bay is exposed to swells coming from the South and East which unfortunately are the prevailing directions. However if swells are small, or strong winds are blowing from the North or West, then diving this site can be rewarding. Divers can enter directly off the beach or from the rocks on the North and South sides of the bay. Before entering it is worth stopping at the beach and watching the swell entering the bay. If the swell is breaking on the rocks on either side of the bay then avoid that side when you dive. If the swell is breaking on the beach then don’t bother diving! Entry from the beach is the easiest but least exciting option. Entry of the rocks provides quicker access to the deeper and more interesting areas at the site. To enter from the South side park at the toilet block at the end of Kingsley Drive and follow the path on the Southern side of the bay till it comes out on the rocks about ~200m from the beach. 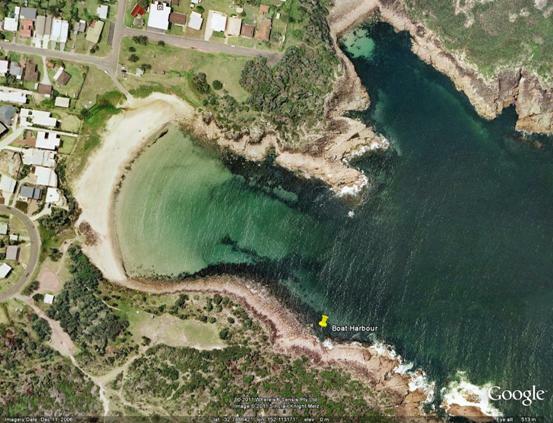 On the Northern side park at the end of Ocean Parade and follow the steep track down to the rocks ~200m from the beach. The center of the bay consists of a sand bottom which drops away to a depth of around 15m as the entrance of the bay is approached. On either side of the bay are the tumbled round boulders which are typical of the coast in this area. There are some areas of kelp where the boulders meet the sand and where the rocks are rough enough for the kelp to cling on. The shallows host the usual temperate schools of Yellowtail, Bream and Yellow Finned Pike. The rocks harbour Girdled Parma, White-ears, and Half-Banded SeaPerch and the kelp shelters Yellow-Finned Leatherjackets and Crimson-Banded and Maori Wrasses. Over summer a number of small tropicals can also be seen sheltering in the shallow rocky sections. Invertebrate life consists mostly of Tent Shells and Long-Spined Urchins with other shells and nudibranchs hiding in rocky crevices and amongst the sparse sponge growth under the areas of kelp.